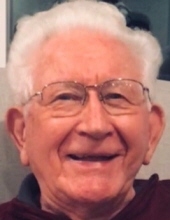 Dr. Walter Emmett Collins died at his home in Grand Ledge, Michigan on January 19, 2019 of natural causes. He was 88. Walter met his wife of 66 years, Beverly J. Trask at Delhi Tech and they married in 1952 right before heading to Webb Air Force Base in Big Spring, Texas. They served in the Air Force until 1956. Bev devoted her life to helping Walter and raising their 3 children. Walt had his own practice in Veterinary Medicine and launched the first Vet Tech program at SUNY, Delhi and taught as a professor. Walter is known as the Father of Veterinary Technology. He then became the director of the Animal Medical Technology Program at Mountain View College in Dallas, Texas. They moved to East Lansing, MI in 1977 where Walter finished his career at Michigan State University as an associate professor and coordinator of the Vet Tech Program. After his Lord and Savior Jesus Christ, Walter pursued these passions in his life: Veterinary Technology, gardening, and, he loved being on his computer! Walter was a member of Lake Lansing Baptist Church and served as a deacon there. Walt is survived by his wife Beverly, children: Mark b.1962 (Brenda), Heidi b.1964 (John) and Lawrence James b.1967; grandchildren: Jessica Fox, Amanda Tarver (Matt), Brent Collins (Kim), Taylor Larson (Michael), Abigail Mays (Wesley), Autumn Collins and Lucas Collins; great-grandchildren: Braxton Tarver, Hudson Fox, Kale Collins, Baylor Tarver, Breslyn Mays and Grayson Larson; 2 brothers: Loren J. Collins of Tampa, FLA and Robert Collins of Maine; 2 step-sisters: Dr. Alicia Pagano of Unadilla, NY and Rita Mott of Masonville, N.Y.; sister-in-law Ellen Trask (Keith), NC, as well as many loving nieces and nephews. He is preceded in death by his parents and his brother Fred. To send flowers or a remembrance gift to the family of Walter Emmett Collins, please visit our Tribute Store. "Email Address" would like to share the life celebration of Walter Emmett Collins. Click on the "link" to go to share a favorite memory or leave a condolence message for the family.